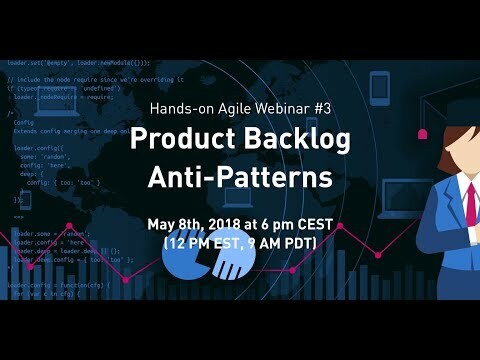 Note: If the browser will not start the video automatically, click here to watch the replay of the webinar product backlog anti-patterns directly on Youtube. Source & Copyright: ©2016 Scrum.Org and ScrumInc. Offered for license under the Attribution Share-Alike license of Creative Commons, accessible here and also described in summary form. The development team defines what is required to consider a user story to be ready for becoming a sprint backlog item. The product owner clarifies questions of the team or invites subject matter experts to refinement sessions who can answer the team’s questions. INVEST? The product owner is not applying the INVEST principle by Bill Wake to user stories. What team? The product owner is not involving the entire scrum team in the refinement process and instead is relying on just the “lead engineer” (or any other member of the team independently of the others). Even in the case, you have successfully identified what to build next, your product backlog, as well as its refinement process, will likely provide room for improvement. Just take it to the team and address possible product backlog anti-patterns. What product backlog anti-patterns are missing? Please share with us in the comments. Is a DoR not part of a anti pattern? A common understanding of how much details a pbi must have is good, but a DoR is often used as a gatekeeper. A pbi is a communication tool – as long as it’s clear, then it’s fine. Thanks. Great advice. I’d like to add one more: Your only option for Backlog Items are user stories. Sometimes user stories don’t fit the requirements. The Scrum Guide talks about PBIs not user stories, yet some people think you have to do user stories if you’re doing Scrum. This may lead to cramped, forced and often tautological user stories, just for the sake of writing stories. It’s up to the team to figure out what suits them best in each case.